The first response from Wavering Willard Romney to the news that the Affordable Care Act had been ruled to be Constitutional was a vow to act to repeal and replace it beginning on the first day of his imaginary presidency. We’ve become accustomed to Romney’s mentality being like that of a cat that puts its head under the bed and thinks that since it can’t see anything now, no one can see it. This latest set of Romney’s magic political underwear will not protect him nor the fantasy he wants to promote about being able to repeal the ACA. Putting aside the probability that Romney won’t have a viable electoral path to the presidency, what if he did win and Republicans won control of the House and Senate, could they really repeal the ACA? To get passed into law, the ACA required a 60 vote majority to overcome a filibuster in The Senate. Such would be the case in any repeal attempt but the Republicans would not have the 60 votes to prevail, even if they won every competitive Senate race in 2012. Remember how Republicans howled about the outrage of Democrats considering the process of reconciliation to get the ACA passed with a simple majority vote? Knowing that they have no shame, couldn’t the Republicans use reconciliation to repeal the ACA with just 51 senate votes needed? Hate to bring more tears to John Boehner’s waterlogged eyes but that’s not exactly going to work. But reconciliation wouldn’t work here—the process can only be used for policies that have budgetary effects and a C.B.O. score. Much of the A.C.A., such as the insurance exchanges and subsidies, would fall under these categories. But a lot of it, including the hated individual mandate, does not. Repealing the exchanges and subsides without repealing the mandate and the other regulations and cost controls in the law would create a health-care Frankenstein that a President Romney would be rather nuts to support. Would the GOP and Romney want to put themselves in the position of having to follow the ACA law and all of its other provisions after having cut its method of financing, adding to the deficit in the process? And if they were able to repeal the mandate, would they really want to deal with skyrocketing health care costs this would cause, let alone the hundreds of millions it would cost to scrap the ACA? Let’s say that they are so driven by hatred for the 99% that they would. Consider requirement number 5. Reconciliation can’t be used on a matter that would increase the deficit for a fiscal year beyond the reconciliation measure. If the funding mechanism for an ongoing program was killed and the law required the program to continue, it would generate an ongoing deficit. That’s simple economics. Since all of the facets of the ACA can’t be repealed using reconciliation and the Republicans would not have 60 votes in the Senate to overcome a Democratic filibuster, the program would continue to run but now it would do so without being funded. That would certainly appear to disqualify it for reconciliation due to The Byrd Rule. No doubt the Republicans would argue some twisted logic about how that wouldn’t be the case but they don’t get to decide this, the Senate parliamentarian decides. And with the CBO stating the obvious, that the costs of the ongoing program would continue while the funding mechanism was killed, it is hard to see how anyone who had at least a 2nd grade education in mathematics couldn’t see that this would create an ongoing deficit. None of this means that Romney or the GOP will stop claiming that they will repeal “Obamacare”. It rallies their mindless faithful and helps them raise money from the wealthy who despise the 99% getting anything. But they know it’s as futile as their upcoming vote in the House to repeal it. They don’t care, hating something or someone and getting other Republicans to do so is the basic goal for this power-obsessed party. They think it’s a potent argument for them, howling for the repeal of the ACA. That may not be the case, it could instead be a meaningful factor in their losing in November. To begin, having the namesake of Romneycare as your nominee is a bit inconvenient. 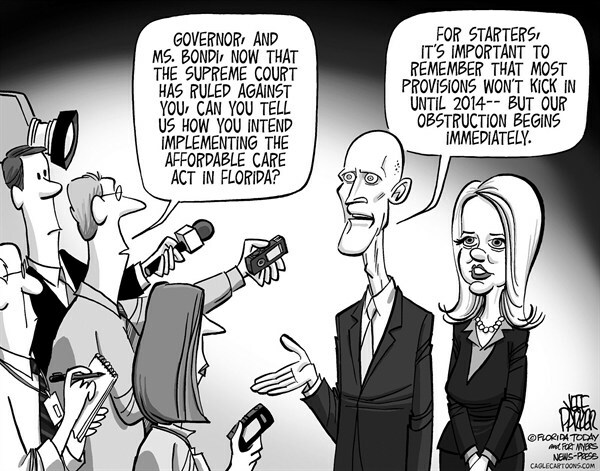 Romneycare was the model on which the ACA was designed. Watching Romney contort himself into saying that his own program is evil if the federal government supports it but great if state governments support it is amusing and ineffective. It further erodes whatever credibility he retains with those who aren’t GOP lemmings. Add to that, in his speech yesterday, he basically said that he wants to maintain most if not all of the benefits of the ACA but without a mandate so that none of it is paid for. Huh? You can have all the ice cream you want and you never have to pay for it? Americans simply aren’t that stupid and Romney’s already not very respected as a source of veracity. Then there is the war weary factor. Americans have been dealing with this war against the ACA for years and have been burned out on it. Many may not support it due to the big money propaganda campaign against it by the corporations and Right Wing but it is not something they feel strongly about. One poll showed that only around 8% of voters saw health care as an important issue in the 2012 election. Now that the SCOTUS has closed the main chapter on the case against the ACA, might not most Americans consider this issue thankfully over? Do Americans really have an appetite to re-invest themselves in a continuation of a futile war against their having affordable care? And if President Obama spends the time and energy to educate the public that the mandate won’t apply to 94% – 99% of the public, will they really be bothered by it anymore? Meanwhile, if the GOP is ideologically driven to make repeal of the ACA a central issue for them and take time and attention away from the issues of jobs and the economy, keeping in mind that the public does not find battling the ACA an important issue, aren’t they voluntarily disarming themselves? As is no doubt being strategized by the Obama campaign, if they can use this victory for the ACA as an opportunity to reverse the negative perceptions of it and make most Americans see it as the positive it is in their lives…and the historic and far reaching nature of it, doesn’t it become a great accomplishment and strength for Obama and his presidency, right alongside many others such as the killing of Bin Laden? Doesn’t it make him look more like a strong and successful leader? And again, doesn’t it benefit him to be taking time and energy away from a monolithic focus on jobs and the economy? At the same time, won’t Romney and the GOP look meaner and smaller as they flail around against the ACA. The Party of No just reminding everyone that they are against everything that benefits anyone except the top 1% exclusively. Roll this message in with their wanting to destroy Medicare as we know it, Social Security, women’s rights, voting rights and on and on. Their ongoing war against the ACA could be just the springboard the Democrats and Obama need to hammer home the message that the Republicans are only about destroying progress for the 99% so that the 1% can become more powerful and wealthy. They only invest their energy in tearing down the country, whether through prejudices, disrespect of the people and our democratic institutions or by trying to strip the people of the support and protection of its government. It is difficult to see how Republicans pursuing their opposition to the ACA would be anything but a boon to the Democrats and President Obama’s re-election. The GOP base may be energized by their hatred over the ACA being held as Constitutional and moving forward but just check around the Progressive blogs and you’ll see a very positive, energized and excited Democratic base over yesterday’s developments. President Obama and the Democrats are winners in a decades-long battle, the fruits of which will be enjoyed by Americans from this time forward. Placed alongside his other big accomplishments, it certainly seems to position President Obama as a truly historic President and someone who is generating greater and greater justification and enthusiasm for his re-election. So the next time you hear Mitt Romney unconvincingly announce that he will repeal and replace “Obamacare” or nitwits like Bobby Jindal declare that they will refuse to set up a state health care exchange (then the Feds will simply go into the state, take away some of Jindal’s authority and set up and run the exchange themselves…what a genius Republican, voluntarily giving up power in his state to the hated federal government! ), you might want to send them a thank you note and an “Obama/Biden 2012” bumper sticker. Wow! Who knew republicans even had a sense of humor? Hey Glenn, welcome to The Planet! I think the Repubs are funny unintentionally. BTW, your comment was moved here from a post. To comment on articles, you can either click the “Reply” button on a comment or the “Click here to leave a comment” at the bottom of a post. Thanks. Just wasn’t sure how this site worked when using it the first time. and it has some interesting thoughts on “What Next. The sixth point in the post has to do with reconciliation and it is one of the best on the subject I have seen, much of it has been said here on the Planet. It’s almost as good as your explanation, AdLib. Excellent article AdLib with some great wonkish policy stuff. You know the stuff the GOP hates. But I don’t think you can understate how a Romney presidency can damage Obamacare’s implementation. Like all Republicans he will govern according to their self fulfilling prophecy that guvment is bad and does not work for the people. The biggest thing he could be successful taking away with the conservadems in the Senate is the fixed P&L ratio in the bill. That’s really the biggest thing greedy corporations want to cut out of the HC law NOT the mandates which they like. Believe me enough lobbyist money could buy 60 votes for something like that in the Senate even if the GOP does not have a filibuster proof majority. For that reason and many others we need to make sure Obama is reelected to sure up his veto powers so Romney can not reverse Dem accomplishments. Thanks KQ. I agree that the insurance corps have to have at the top of their repeal list, removing the cap on profits and CEO pay. Knowing them, they would try to hide that in a repeal of something else in the ACA that they demonize. I don’t underestimate the self-destructiveness of the greedy like Romney but as I mentioned above, trashing the ACA would cause medical costs for people and the government to skyrocket, blowing the deficit up and pushing the economy into recession again. Does Romney want to be a one-termer? Maybe he doesn’t care but the natural result from an economically disastrous Romney Presidency would be a Dem elected as President after one term and likely a Dem majority returned to Congress. He sure could do a lot of damage in 4 years but he would not get another 4 and neither would the Repub Congress. It’s a very nihilist proposition. Now, could they get the 60 votes to repeal it, in this hypothetical situation where Romney wins the WH? It is possible but I wouldn’t bet on it. Yes, the insurance companies would do their best to bribe the number of Dems they would need but as the ACA would represent an enormous and profound legacy for the Democrats and the repeal of it would be terribly destructive to the party as a whole, I would think that the powers that be in the party would come down very hard on insisting Dems find some other way to be bribed. It’s going to take years for the ACA even if implemented correctly to show a decrease in costs. I think by the end of Romney’s term the economy will naturally bounce back and Romney will get credit he does not deserve. Will the insurance companies really want to rock the boat and work to overturn the reform act? Perhaps not. They now have a guaranteed pool of customers and a guaranteed operating/profit of 15-20%. That’s not bad. Their main endeavor maybe to lobby for the development of loopholes and not the demise of ACA. But their operating profit USED to be 25-30%. They are deeply worried the demands on service will cut that profit even more. Already some insurance companies are OUT of the health care coverage business. They don’t like this at all. 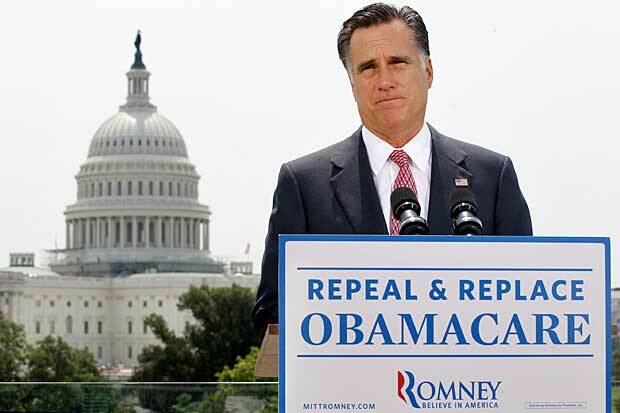 They are supporting Romney to get back their right to cut, reject, dismiss, and oust anyone who actually NEEDS insurance. I think I’m losing this argument, you, AdLib and KQ all seem to ganging up on my optimism. You all may be right, I just have this feeling that they will accept the captive customers as a trade off and nibble at other portions to regain their profit margin. Am I being too much of a ‘glass half-full’ again? Not the first time. I think they care more about the profit margins than the gross profits. That’s how big business funnels money into perks for the 1% to corporate officers or stock holders. Conservatives have been moderately successful at changing legislation like Medicare Advantage for example. I also don’t trust some Dems who did not like the PL ratio to start with anyway. Nibbling at the corners of the ACA can do great damage. Perfect example, Medicare Advantage, KQ! That was/is a huge money maker for insurance companies and a huge loss for the Medicare fund. It was a very contentious subject in the Senate mark-up on ACA. That is what I think they will be doing instead of killing ACA, nibbling at the edges, creating loopholes. I took the liberty of adding a link to this post at my own blog. I wrote a similar post about the repeal vote and saw your writing and thought there was no way I could explain it any better than you did. The phony outrage by the GOP spurred on by the “tax” issue, is so transparent as a dumb gotcha game. When you stop for a moment and consider it, Roberts is the only justice out of all nine who calls the mandate a tax. It is a convincing 8-1 decision that it is not a tax. The RW four declared it an unconstitutional penalty, the more liberal 4 saw it as a legit penalty under the Commerce clause. Only Roberts saw it as a tax. That aside, the railing by Repubs that they’re are shocked that something in DC might not be 100% truthful is an SNL parody. Even though their accusation is false and dishonest, even if it was true, as you say, they are portraying themselves as naive rubes who just believe whatever they’re told by the rival party? Of course, they are lying and being deceptive while claiming naivete so it is ridiculous. At the same time they are howling the ACA was not what it appeared to be, they have scheduled a vote to repeal the ACA which is so blatantly…not what it appears to be. It is unquestionably nothing more than a tantrum, they know full well that right after Obama has prevailed in the SCOTUS on this, he’s not going to sign their tantrum into law. So, the serially dishonest GOP is staging a phony vote as a campaign stunt, to hopefully energize and rally their base. Meanwhile, so much legislation having to do with jobs and the economy is ignored and delayed by them. Too bad we don’t have a media that puts the moronic game playing of GOP politics into proper perspective but thank goodness we have bloggers such as yourself who do. Even with the South lagging behind, much of the country looks like it will cover the poor. Meanwhile, the South will be dragged down economically as the rest of the country benefits. 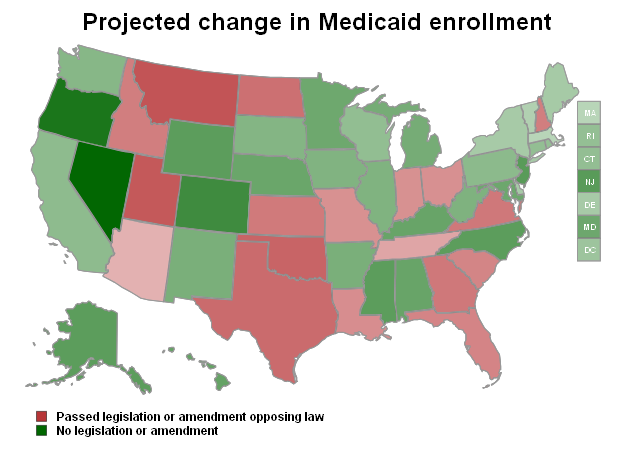 That should hopefully lead to some changes in Repub Governorships and legislatures as people flee those states for states with Medicaid. I mean no disrespect to the folks of the South, but there seems to be a lot of ignorance there. I’m sure that there are plenty of smart folks but there seems to be a lot who are simple minded and easy to lead against their own best interests. Nirek -- if you go back to the “late unpleasantness”, ask the same question of why landless or at least slaveless white Southerners supported the war of the Planter Class. They were fearful of slave rebellions. They were hardscrabble, fundamentalist folks who thought that God would seek vengeance against them for slavery via slave uprisings. (Personally it would have made me an abolitionist if I thought God was gonna smack me down for that, but…) Only way to stop that? Repress slaves MORE. That always works well. This pervasive sense of doom, of victimization by anyone not of their ilk, of judgement by God, is of such long standing and is so deeply embedded in Southern mindsets, I’m not sure it will ever go away. What continues to be mystifying is that poor whites who are utterly screwed by rich whites continue to accept this caste system because it supports and reinforces their only “superiority”: being white, conservative Christians and therefore better than Black people, liberals, and Yankees who are not “real” Christians in the Southern mind. By myths we live and die. Someday they may shake off the pretenses holding them together. Today is not that day. Nirek, I think there are a lot of factors that combine in the South but as Kes mentioned, ignorance is nationwide. I think there is a correlation between poverty/income inequality, poor education, religious absolutism and Republican power. While it appears in all states, it is mostly concentrated in the states that are the poorest or treat their citizens the worst. Lower incomes lead to lower property taxes which lead to lower financing for education. Those who are less informed and less educated are more likely to defer to authority figures and no one does authority figures like conservatives. The simplistic dogma of conservatives, us and them, good and evil, etc. caters to the less educated and the style of absolute obedience to authority figures and conformity is intentionally modeled to be similar to religion. So, people in this vicious cycle are indoctrinated at young ages both into their religion and political party, namely the GOP, and pass the conditioning down to the next generation. Critical thinking is not encouraged and in fact, attacked and punished. So many thoughtful people scratch their heads over people who vote against their own interests but once one understands that such people see being a Republican as they see being a Christian, it’s easier to understand. For them, there is simply no alternative to supporting the GOP, it is their religion, part of the foundation of their identity and issues are irrelevant to their faith in the GOP. You’re right though, it is prevalent in the South and parts of the Midwest. But even here in CA, we have plenty of the same types, they’re just fortunately outnumbered. There is a high price for ignorance and the mindless following of others, for some in these states that will spurn expanding Medicare, it will be a matter of life and death. And that’s really hard to wrap one’s mind around, those who support the party that will deny them the care they will need to save their own lives. And as an Ohioan, Nirek, I can vouch for the fact that there are plenty of simple minded, gullible folks who voted to reject “Obamacare” here too. Who knows why? Too much Limbaugh, too little Moyers? Just a thought. Consider the elections in 2016. Two years after the ACA has been fully in effect and the fearful have come to realize that there are no death panels or socialism or taxes for them to pay, just universal and affordable health care for all Americans. And the Repubs will have cemented themselves as the fear mongers and enemies of it. One of the biggest positive issues for Dem candidates to run on in that Presidential election may very well be the ACA. Exactly AdLib that’s why the 2012 election is so crucial for the future. Romney would do everything in his power to damage the implementation of the ACA purely to ensure his reelection chances. While Obama did the difficult things politically to move the country forward. Excellent article AdLib! Wonderfully researched, clear and concise observations and very well reasoned. If Romney gets the office (heaven forbid), he may be just be dumb enough to try repealing the ACA. But I can’t imagine one of his cabinet members not talking him out of it. It would be a real test of our democratic system to see the ACA being repealed. But, I sure would hope that the attempt is never made. I have seen some articles suggest that such a repeal would add billions to the deficit. Could they (the GOPers) really be that stupid? I know they constantly attack Obama over the deficit, but when they are in power, they don’t seem to care one bit about the nation’s debt. See GW Bush for a splendid example. Re your comment that a repeal of ACA in a Romney presidency would add billions to the deficit would probably be just a little bump, easily explained as the forewarned consequences of a failed one-term prsident who brought an economis holocaust to the country. And, as ChoiceLady points out, the gullible, frightened, uneducated who believe the Repub message will search their bibles and find some obscure passage that foretold the danger of electing a Black man whose people had given aid comfort to Noah’s son (thanks CL for this interesting tidbit). In a parallel universe, where Romney had a path to the WH (I don’t believe he actually does), if he took such unconstitutional actions, there would immediately be legal action taken against him for violating the Constitution, we would have a serious constitutional crisis on Day One of this imaginary Romney presidency, which he would lose and end up crippled in his first and last term. But back to reality, Romney will not win, he is behind in the swing states and at this point in the cycle, he should be at his strongest there. Romney can only be beaten down from where he is right now, on Bain and lying and his poor performance as MA Gov. We should take nothing for granted and work and donate as much as we can up until Nov but I am more confident today than I have been, that Obama will decisively beat Romney’s behind in Nov. and bring some more Dems into Congress on his coat tails. I like your article, and I especially like the way you think. I too believe that President Obama will be elected. I have an intense mistrust of poll results. I rely on my own system: the “like” factor…a simple “Do I like this person?” Unscientific, I know, but every poll asks what we like or dislike about whoever is doing whatever. By any measure, President Obama soars; Romney doesn’t even place. Thanks AdLib; good food for thought. Well, I think my state, Ohio, will back Obama much more than Romney. They say no presidential candidate ever won without winning Ohio! I sure hope that continues to be true. Heard this morning that Obama leads in Ohio by 8 points or more (depending on the poll) over Mitt but that NO poll has him trailing Mitt. More like 6 points in PA, but still ahead. No poll has Obama trailing Romney there either. First Day in Office -- Willard signs some Executive Order abolishing ACA on his first day in office. Second Day in Office -- Senate moves to impeach Willard for his first day in office. This is very clever, very funny. Heh! You left out the word “imaginary” before “First Day in Office” for Willard. I think we can wait to impeach him on Imaginary Day Two for his Executive Order requiring all those making under $1 million to be slaves of those who do. Romney will not become President. If he could, he would be far ahead of Obama in the polls right now. We know from experience, the more the public sees of Romney, the less they like him. 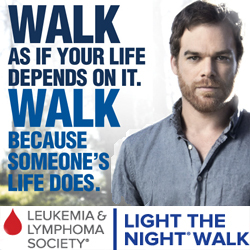 We’re only going to see more and more of him…especially in Obama commercials. And the impression of him that will be left in the public’s minds after the debates will be devastating and permanent. He can lie freely right now but in a mature and professional way, I expect Obama to corner Romney as the hypocrite and liar that he is, for all of America to see. The debates may not be watched by everyone but the memes going around the MSM afterwards will have a big impact and not in a good way for Romney. Here you go, AdLib. This article and chart supports your view that healthcare won’t be a campaign issue. A new Gallup poll finds that health care down on the voter issue list of importance. Health care is No. 5 on the issue list, behind the general economy, jobs, “dissatisfaction with government” and the federal budget deficit. Sally, thanks for the graph and data backup on this! 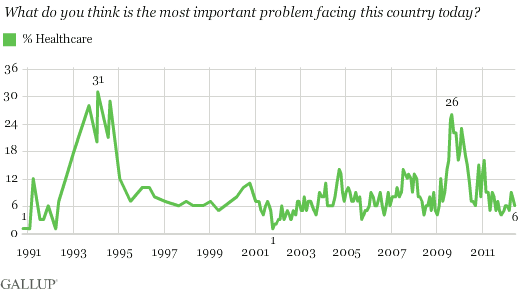 It looks to be close to only 6% of Americans who see it as an issue. Instead, I would be very interested to see a poll that asks, “Do you see President Obama as a strong and effective President?”, this ruling could only have elevated respect for Obama. America loves winners, Obama has proven repeatedly that he gets results and makes big things happen. I do want him to keep that side of the campaign going, the ACA, killing Bin Laden, rescuing GM, ending DADT, and on and on! Well, AdLib, I couldn’t find a poll if President Obama is viewed as a strong and effective President but I think this might come close. Survey results also reveal that more than one-third (36%) of Americans believe UFOs exist. More than one in 10 (11%) are confident that they have spotted a UFO, and one in five (20%) know someone who claims to have seen one. -- In regards to national security, nearly two-thirds (65%) of Americans think Barack Obama would be better suited than fellow presidential candidate Mitt Romney to handle an alien invasion. In fact, more than two in three (68%) women say that Obama would be more adept at dealing with an alien invasion than Romney, vs. 61 percent of men. And more younger citizens, ages 18 to 64 years, than those aged 65+ (68% vs. 50%) think Romney would not be as well-suited as Obama to handle an alien invasion. I’d say that makes Obama pretty damn strong! Oh, but of course those Aliens may be from Romney’s home planet, that one they go to after life here. Name? You know if, AdLib. Ah, you mean planet Kolub, of course. Actually, I’d suggest that Earth has already been invaded by aliens and that Obama is fighting them off. Ever seen Invasion of the Body Snatchers? That perfectly explains what’s happened to the GOP, not to mention the hollow humanoid shell called Mitt Romney in which a cold blooded alien hides. I have a friend that refers to right wing lackeys as “pod people.” I think he may be on to something! But, AdLib, even as silly as this is about Aliens, 65% think the President is the best guy to handle it. I say that makes him a pretty strong leader among all those UFO watchers and Coast to Coast radio listeners. He’s been preparing with all those drones. Have you ever noticed that all those people that have been abducted by Aliens are on a dark country road, in their pickup truck, and have had a couple of beers? Aliens don’t seem to care to abduct anyone coming out of Starbucks and there are so many Starbucks, too. Oh, but if they are Mormon Aliens, they don’t drink coffee. But, how about those beers that the guy in the pickup had? Oh, hell, those Mormon Aliens are just as far out there as regular Mormons. Sally, love it! Exactly the kind of judo flip I think would be very effective in dealing with the “tax” attacks of the Repubs. Let them throw themselves behind the charge of “tax” then take it and flip them on their backs. The mandate, meanwhile, would hit a small amount of Americans — somewhere between 2 and 5 percent — according to a study from the Urban Institute. The number could be even lower depending on the law’s success: in Massachusetts, the only state with an insurance mandate, less than 1 percent of the state’s residents paid the penalty in 2009. AdLib, everyone hates paying taxes, so they say, and even the word seems to anger some; this is what the R’s are taking advantage of--the word taxes. So let’s split hairs here. Their isn’t any tax in the ACA, there are penalties for not getting HC insurance that will be collected through the IRS, the governments revenue collection arm. Even if the authority of the individual mandate had been given under the commerce clause, the penalties would have been collected by the IRS, no difference but since the SCOTUS said that the individual mandate was legal under the right to tax, the R’s are now calling it a tax. There wasn’t any change, it was and is a penalty whether it’s commerce or ability to tax. Like I say it may be splitting hairs but Dems would be better off calling it what it is, a penalty, and not let the R’s propagate the use of the word tax. Don’t let them go there! Bito, you’re right about this, it is a de facto penalty because no one need be subject to this tax if they are socially responsible and pay for insurance they can afford so that the rest of society doesn’t pay their medical bills. Yes, John Roberts has declared it a tax for technical reasons but it does not operate like a tax nor does it derive from an activity, just the opposite, it derives from not doing something, being socially responsible. So, is the fine for not wearing a seat belt really a tax? The reason there’s a fine is because someone did not do something that is for the well being of themselves, others in society and results in great costs to the community and government. How is a fine for not wearing a seat belt so different from a fine for not carrying insurance? How are penalties for not doing something preventative that has great costs to society if not done, a tax? Yet, we must accept that to argue the semantics of calling this a tax is a problem. On one hand, we want to pound Repubs over the the head that Roberts and the SCOTUS have spoken and they have to accept it. If we then argue that Roberts’ opinion on calling it a tax should be ignored, it undercuts us. My feeling is that it’s better to not argue the semantics but to define what it is and who it affects. Using judo instead of karate. We should use the tax assertion against them, to give one opportunity after another to define that it is in essence, a penalty that need never be paid by responsible Americans.